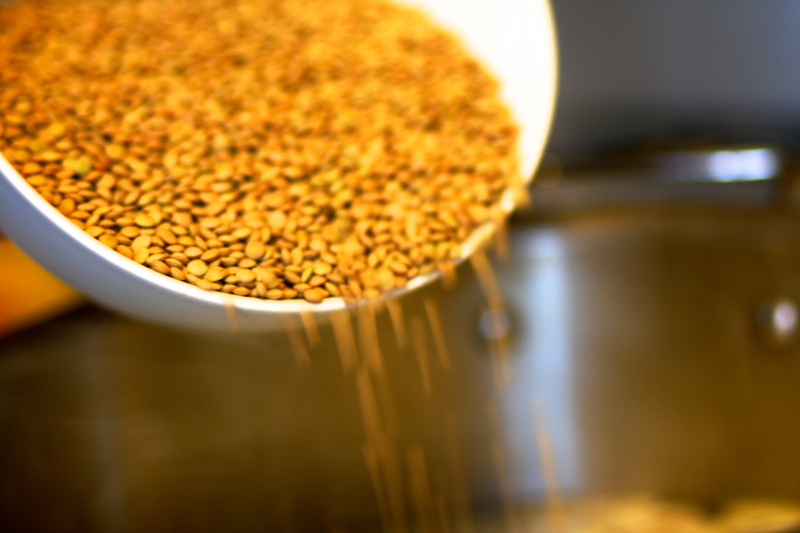 Pick through the dry lentils to remove any small pebbles or discolored beans. 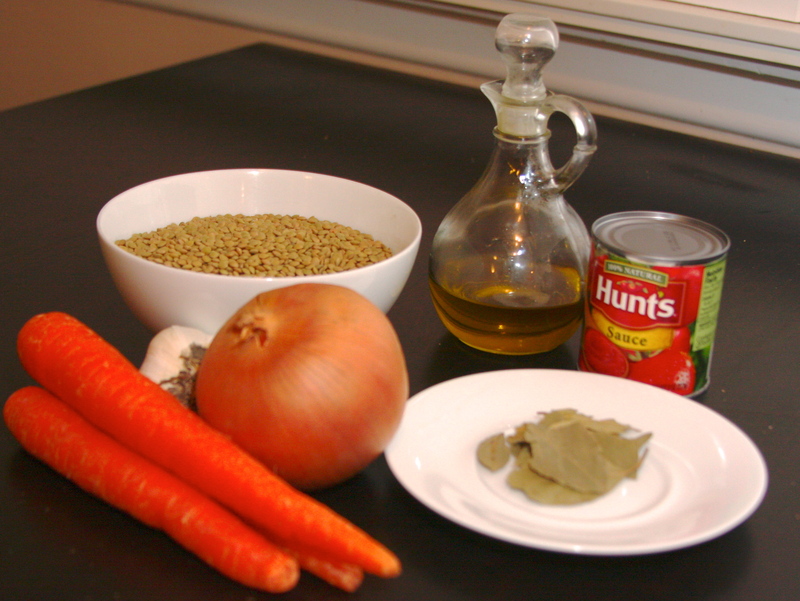 Add the lentils to a large pot with about 9 cups of water (the water should be about four times the height of the lentils)*. Add the onion, carrot (if using), garlic and bay leaves. SLOWLY bring to a boil and then reduce heat to a rapid simmer and cook, uncovered, for 30 minutes. Be sure not to bring to a boil too quickly or simmer at too high a heat because that will cause the lentils to pop open. Add tomato sauce, cumin, salt & pepper (if using) and cook for 15 minutes more. Add olive oil and cook for an additional 15 minutes or until beans are soft. 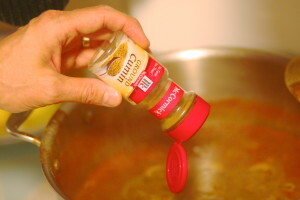 Adjust seasoning to suit taste. Total cooking time is one hour. Once the soup is served, each person can (and should!) add a splash or two of red wine vinegar to his/her bowl. The vinegar really brings this soup alive, but too much can be overpowering. As Thea Athenoula said when she was teaching me how to make this ‘you can always put more, but you can’t take it out if you put too much…ok?’. *Feel free to adjust the water according to your preference. More water will make it soupier, less water will make it thicker. You may want to keep a small pot or kettle of water boiling on the side. That way if the beans have absorbed a lot of water and are still hard, or the soup is looking too thick, you can adjust by adding a bit of hot water. Serving suggestions: As we mentioned above, this soup is perfect with a great crusty bread for dipping. Try it with some feta sprinkled on top – so good! Also, although it’s intended as a hot soup, cold leftovers are delicious. 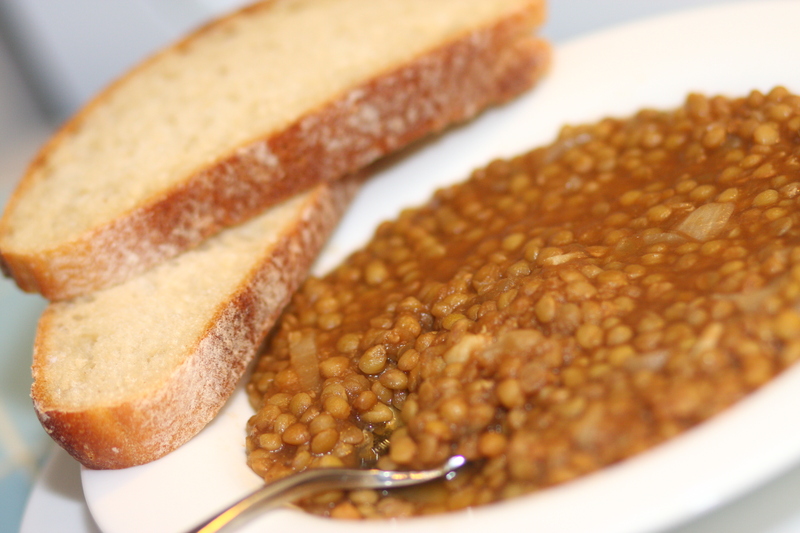 This entry was posted in Lent, Main Course, Soup, Vegetarian on March 11, 2014 by cousins. Was wondering if I could use one of these for a short promotional youtube clip (1 min) announcing an event for my not profit trade association. Don’t really know how to provide credit (mixing video myself and I’m an amateur) and would prefer to pay something nominal (or gain advanced permission). what are you looking to use exactly? photos? I found this wonderful site through Back to the Drawing Board. Unfortunately I am having trouble subscribing. They sent me a confirmation email and the link in it doesn’t work. I love Greek food and I am looking forward to trying some of the wonderful recipes on this site. Thanks for your kind words and interest in our blog. I will look into the issue re subscribing.